Orange fish eggs it is always used as a topping Sushi rich in Omega-3 fatty acids. The content can also protect you from heart disease. Even so, you should know that fish eggs also have high cholesterol content. It would be better if you do not consume them in large quantities or levels of cholesterol in the blood can be increased. Sushi salinity was low. But the salt content in soy sauce which is used as a complement to eat sushi was very high. One sachet of soy sauce contains 1 gram of salt, and the maximum amount of salt intake is six grams per day. Soy sauce made from fermented soy beans. You should avoid soy sauce for those who have high blood pressure problems. Two studies conducted by the American College of Gastroenterology reported an increase in cases of anisakiasis infection (roundworms) that occurs when eating raw seafood in sushi dishes. When ingested by humans, the roundworm larvae enter the network path stomach and intestines. This causes sudden abdominal pain, bloating and diarrhea. Roundworms can also be transmitted through cat and dog. According to the National Health Service (NHS) England raw fish must be frozen in temperatures of minus 20 degrees Celsius, at least for 24 hours. This method can kill the roundworm larvae. health monitoring of food. Excessive content of mercury associated with the risk of neurological disorders, including damage brain, deafness and blindness. Pregnant women are advised to limit or avoid consumption of some fish, including raw tuna during pregnancy. 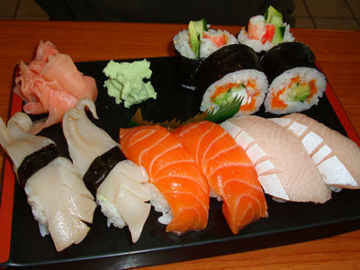 One of the most common bacteria found in sushi is Staphylococcus aureus. Trigger it more often because the bacteria was also found in the sticky rice which is used as the main ingredients of sushi than raw fish. If the rice is not chilled immediately after it is created, then the bacteria will appear on the surface, leaving it at room temperature, which will increase the risk of more toxins. make sure you eat sushi as soon as possible after it is made. Hopefully the article Sushi Not Always Healthy as You Think useful for you.